Laverick Steps at Bell Island Cottages in Whitby, Yorkshire sleeps 2 people. Bell Island Cottages in Whitby is a one bedroom cottage which is full of charm and character and makes the perfect bolt-hole for a romantic escape. It retains many original features including sash windows and a winding ‘fisherman’s’ staircase. Laverick Steps has been decorated with traditional Farrow and Ball paints, and is approached via a flight of steps. The cottage is spread over three floors. The entrance leads into a traditional open plan living space which offers a warm and cosy atmosphere with porcelain flooring. A staircase leads to a spacious marble/mosaic bathroom with shower over P-shaped bath. Winding stairs continue to a light and airy double bedroom with a pitched roof, dorma windows and traditional furnishings. The stunning North York Moors National Park is a walkers and cyclist paradise, with routes to suit everyone from championship level cycle tracks to a stroll along parts of the Cinder Track, which runs from Whitby to Scarborough along the railway line. The Cleveland Way is always a popular choice as it runs across cliff tops and down into hidden bays and coves such as Robin Hoods Bay, Staithes and Runswick Bay. 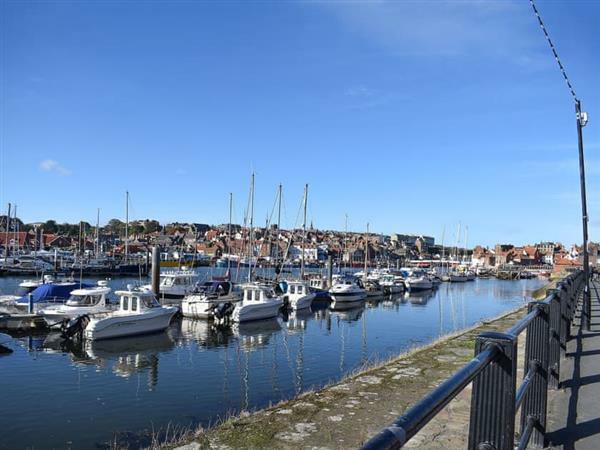 Neighbouring Scarborough has two large bays, an open air theatre boasting top international artists throughout the summer, a water park and the Sealife Centre. You will find the beach 400 yards from Bell Island Cottages in Whitby. With the shop 100 yards, and the pub and restaurant are only 15 yards from Bell Island Cottages. Laverick Steps can be booked together with Bell Island Cottage (ref UK2591 [Bell Island Cottage]) to sleep up to 6 people. Laverick Steps has steep steps to the entrance. Living area: With 24 Freeview Smart TV. Gas central heating, electricity, bed linen, towels and Wi-Fi included. Welcome pack. On road parking. No smoking. Holidays at Laverick Steps, Bell Island Cottages run from Monday to Monday. For a better idea of where Bell Island Cottages - Laverick Steps is, you can see Bell Island Cottages - Laverick Steps on the map below. Bell Island Cottages - Laverick Steps is in North Yorkshire; should you be on the lookout for a special offer, you can find all the special offers in North Yorkshire. It's always worth checking to see what is on offer at the moment. Do you want to holiday near Bell Island Cottages - Laverick Steps (UK2592), you can see other cottages within 25 miles of Bell Island Cottages - Laverick Steps; have a look to find your perfect holiday location.